Google announced on Wednesday that its Google Play store for Android has seen 25 billion downloads to date, and a total of 675,000 applications are now available. The announcement, made on the company's official Android blog, comes a few weeks after Apple provided its own update on the success of the iOS App Store. At the iPhone 5 media event, Apple revealed that the App Store had more than 700,000 applications, with 250,000 of those written specifically for the iPad. Apple also announced that 90 percent of the applications on the App Store are downloaded every month, and that the average user has more than 100 applications installed on their device. Google's post did not offer comparable statistics. As for the total number of application downloads, Apple's App Store reached the 25 billion mark in early March, or nearly 7 months before Google gave its own update on Wednesday. 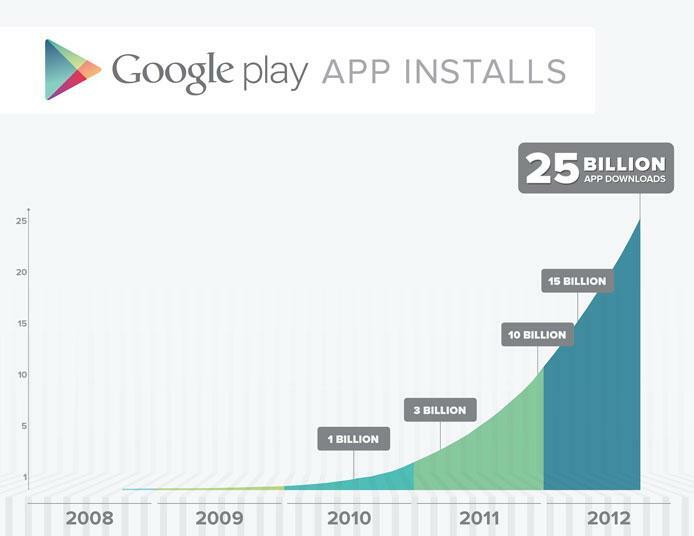 Apple's App Store launched three months before Google Play, then known as the Android Market, in 2008. To celebrate the milestone of 25 billion downloads, Google is offering discounts on content available on Google Play. Creations from developers including Electronic Arts, GameLoft, Rovio and more will be on sale for 25 cents, while the company will also be highlighting special prices on movies, books, albums and magazines. While it's a relatively close battle between Apple and Google in terms of applications available and user downloads, estimates have shown that Apple's App Store dominates in terms of paid applications. One study released last year found that Apple's iOS platform took in about 90 percent of all dollars spent on applications for mobile devices.